Until now, there has been only one complete glacier inventory of New Zealand and it dates from the late 1970s. That inventory is based on manual mapping of orthophotos; only a small portion of the inventory was updated in 2009 for the central Southern Alps of New Zealand. As glacier inventories should be updated every 5-10 years, an update was long overdue. Additionally, in comaprison with glacier areas in the Northern Hemisphere, the Southern Hemisphere is underrepresented concerning multi-year coverage of glacier outlines. Therefore, we created a new glacier inventory based on semi-automatic mapping using Landsat 8 data from Feb/March 2016. Bare glacier ice was mapped using the well established band ratio approach (red band / shortwave infrared band) and debris covered ice was mapped using a supervised classification. These data had to be post-processed due to misclassifications (e.g. lakes, shadowed areas), and the bare and debris covered sections had to be connected. Sentinel-2 data from the same time span were used for the post-processing as they were too heavily cloud covered to be usable for the automatic mapping. The new inventory has a glacier area of 857 km² with 10% debris cover. 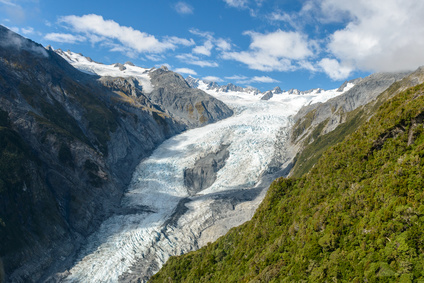 This is a reduction of about 31% compared to the late 1970s.The reduction of the glacier area on the North Island alone is even more severe: the area was reduced by 71%. The minimum altitude of the glaciers rose by about 80 m (29%) from 298 m a.s.l. in the late 1970s to 384 m a.s.l. in 2016. Glacier lakes increased at the terminus of the glaciers and completely new lakes were formed in several places. With the results of our research it is possible to calculate the total area of glacier change in New Zealand for the first time. These findings are very important for detecting regional differences of glacier behavior and to connect these differences to their relevant drivers. Furthermore, our data are an important input for climate and hydrological modeling as there is a lack of data from the Southern Hemisphere. Due to the 12-bit resolution of the Landsat 8 images we used in our study, the red band doesn’t saturate (which means it can measure subtle differences in the reflection brightness of the glaciers). The red band is an essential for automatically mapping glacier area; so using it reduced mapping errors. A second benefit of the increased radiometric resolution of Landsat 8 was better visability in shadowed areas compared to images from earlier (8-bit) Landsat missions. 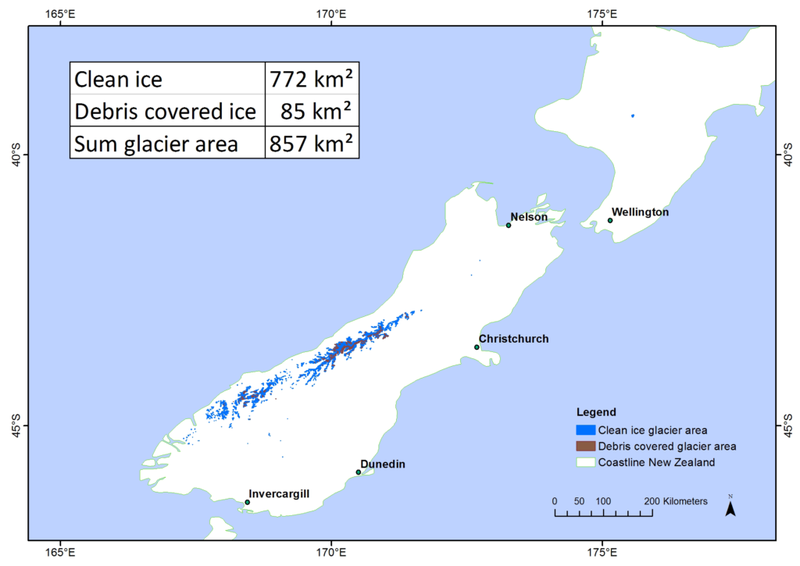 Will your new New Zealand glacier inventory (2016) be publicly available? Yes, the data will be publicly available. We aim to publish our paper in 2018, and the glacier outlines as well as additional glacier attributes will be available free of charge in the GLIMS glacier database. Clean ice glacier area (blue) and debris covered area (brown) of the 2016 glacier inventory of New Zealand. Image credit: Anderson et al. Funding in part provided by the German Research Foundation (DFG) Grant BA 4974/2-1.